Nintendo is celebrating a legal victory in France, where an appeals court has ruled that the sale of the R4 and other Nintendo DS "linkers" is against the law. Nintendo's ongoing efforts to combat piracy on its DS handheld suffered a blow in late 2009 when a French court ruled that Nintendo could not legally prevent flash cards created by other manufacturers from running on its systems. 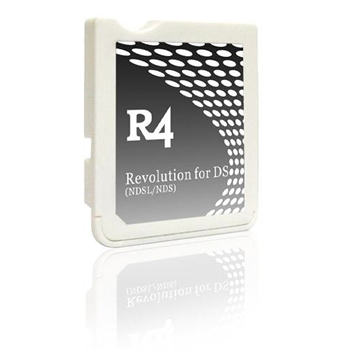 The case centered on so-called "linkers" like the infamous R4, which allows users to run unapproved code, usually meaning illegally copied games, on the DS. The prosecutor in the case, supported by Nintendo, quickly appealed. It took a couple of years for the matter to work its way through the system but the second time appears to be the charm for Nintendo, as the Paris Court of Appeals, the country's second-highest court, overturned the earlier decision and issued guilty verdicts against six companies for importing, selling and distributing the devices. The offenders were fined more than €460,000 [$611,000], ordered to pay more than €4.8 million [$6.4 million] in damages to Nintendo and in some cases were even given suspended prison terms. Nintendo said in a statement that the ruling "represents a strong message to French companies dealing in these devices, that such activities are illegal and will not be tolerated." It also noted that the decision brings France in line with other European countries including the Netherlands, U.K., Germany, Italy and Belgium, where similar decisions have already been rendered. In the U.S., where citizens have a constitutionally-enshrined right to own and carry as many guns as they want, R4 devices have been ruled to be in violation of the Digital Millennium Copyright Act.